These wildflowers have a story………..
Back in August 2015, right before I headed to California for a 2 week vacation to visit long-time friends, I had a wild dream….. I dreamed that I hiked up this mountain and came out to a giant cliff overlooking a beautiful mountain valley. Across from me was a garden in the valley, being dug up and prepped for new growth and new plants, it was completely empty (so I thought), but I realized that something was being planted. I couldn’t see the seeds beneath the soil, but they were definitely there! There were other people on the cliff with me and I turned around, and someone had a bouquet of wildflowers. As they handed me this GIANT bouquet so vibrant in color, the person said to me, “Something new is happening. Something new is about to begin.” As I accepted these wildflowers, I was so overwhelmed with emotion and I started crying tears of joy. I woke up that morning from the dream with actual tears of joy in my eyes. It was the most incredible experience I’ve ever had from a dream! I knew intuitively what this meant for me. All the soul work I had been doing the previous year, the personal growth, seeds being planted, all of it. I took this dream as a message from the universe and I wrote it down, and I’ve never forgotten it! A few days later, I left on a flight to California to spend an incredible 2 weeks there with my friends in the LA area. I also visited a friend in San Diego for a few days. One morning I was at a French cafe there in downtown San Diego called Cafe Chloe…..it was raining….and I remember this feeling of almost like I was in a different world…..like I was in France. I was eating breakfast and sipping my coffee…..and I just got this feeling like… this is the time…..the time to go to France…. Now at that time, I had been dreaming and planning of going to France over the past year since the summer before — slowly and surely making steps in that direction. I had moved and downsized at this point from my one bedroom apartment in Franklin, TN and had moved into a studio apartment a couple of miles down the road. I had sold many of my belongings and was planning to be there in Franklin for maybe 6 months to 1 year….thinking, when will I have the time to go to France? I had just accepted an offer at the Opryland Hotel which I did not feel peace about, but nonetheless, I thought it was the most “sensible” next step, at least from the societal norm. While still in California, two days before heading back to Tennessee, I got a phone call from the HR department at the hotel and they informed me that they would have to push back my orientation 2 more weeks (I was supposed to start at the end of the month) and they asked me if that was ok. I remember knowing intuitively in that moment…..this is happening for a reason. The time has come. I’m supposed to go to France….like now!! Sometimes we wait for the perfect time or the “right” time to do something, to reach a goal, to make something happen, to put action behind our ideas and dreams. But if we truly open our eyes and see the signs and the opportunities and timing in front of us…..if we truly follow our intuition….we end up exactly where we need to be. So in October 2015, I headed to Europe! Luckily, the previous summer, I had been a French translator for Agape France and Cru Highschool for 2 weeks on the French Caribbean island of Guadeloupe. I made many new friends there and ultimately my trip to Guadeloupe had connected me to the organization headquartered in Paris. One of my French friends in Guadeloupe, Kirsti, connected me to her friend, Manon, in Lyon, France who offered to host me for a time! Kirsti told me I had to visit Lyon and that I would love it. It was incredible! The timing, the opportunities, the connections — all of it fell into place. I trusted my intuition and my network and I truly was starting to see that the Universe indeed does have our back. If we trust ourselves and our intuition, the Universe will provide the rest. I arranged a work exchange with the organization in Paris and the staff agreed to host me in exchange for administrative work as a volunteer. So I spent 3 weeks in Paris, 2.5 months in Lyon, traveled around the eastern part of France and the French Alps, to various towns and regions. I spent a week in Switzerland and visited the village where my family is from near Zurich. And I spent a week in Iceland on the way back to the States through my “Stop-Over” through Iceland Air. So Iceland……an incredibly beautiful and majestic country. My week there was filled with lots of fresh food, Arctic fish, fresh snow (and I mean a LOT of snow), tours of one of the national parks, geysirs, waterfalls, geothermal hot pools, and the Northern Lights! One evening I decided to try out a restaurant in Reykjavik that locals had told me about called Sægreifinn (The Sea Baron) which apparently had amazing lobster soup for a very affordable price. The Icelandic Krona was very expensive compared with the American dollar, so I was looking to watch my food budget for sure! I walked in and ordered the famous lobster soup which came with fresh bread and butter, and I ordered an Icelandic beer, and sat down and ate to my heart’s content! Let me tell you…..this was one of the best meals I have ever had!! Absolutely delicious. Especially on a cold, Arctic winter night! I was the only person in the restaurant at the time, and then a few moments later, this tall, dark, handsome guy walks in with long, dark, curly hair wearing a Canadian beanie. He ordered the same exact thing, minus the beer, and sat down and started eating. As the only other 2 people in the restaurant and traveling solo that night, we of course started chatting 🙂 We soon discovered we both were traveling alone and that his name was Sander. He was a travel photographer and environmental photo journalist capturing the scenery in Iceland, and this was his third time there! He had been in Iceland for a few months and was waiting out the stormy season in his current home on the west coast of Canada. We were definitely kindred spirits and had such a great connection that we exchanged contact info and agreed to meet up to go to the geothermal hot tub together which we both had been wanting to do! So the next evening, we met up and shared more stories while relaxing with the Icelandic locals in the naturally heated geothermal hot tub in Iceland’s capital city of Reykjavik. It was so surreal, this experience. It is one of the many reasons I love traveling alone. Not only does it take courage, but it also opens up so many experiences that you wouldn’t necessarily get if you were with a group. I’m grateful to have met so many incredible people around the world during my travels. After hours of sharing stories of our travels and wilderness experiences and epic adventures, we headed to Sægreifinn (The Sea Baron) again for dinner. Then, onward to a cafe for coffee and dessert. I remember hugging Sander goodbye that last night in Iceland as we talked about how the Universe points us in the right direction through all the connections and synchronicities and points on our map. It was incredible to meet such a like-minded soul and his story really touched me. We agreed to stay in touch and to write each other. We gave each other the warmest hug and I waved goodbye on that cold, Arctic winter night as my bus arrived to take me back to my AirBNB. A few days later, I arrived home back in the States, spending one night in New York City before my flight out to Nashville the next day. Arriving back home was definitely a reverse culture shock experience, after being immersed in French/European culture for 3 straight months. I was thinking in French, slipping French words, stumbling to find the English words that I innately knew. It was hilarious! After studying and speaking French since I was 14 and being mostly fluent the past few years, I knew at that point, upon returning from France and this full immersion experience, that I had mastered the language. The following 2 months back in the States were were filled with job applications, figuring out my next steps, and getting my bearings again after this incredible experience in Europe. I had kept in touch with my new German/Indian friend, Sander, who had been living on Canada’s west coast for some 8 years now. So he was basically Canadian. But really, he was a global citizen, and I too felt like a global citizen. We don’t have to call one country home necessarily if we desire to explore and travel and choose a different way of life. He and I talked frequently during those 2 months; about our plans and both seeking direction for the right next steps on our path. We talked about life, family, goals & dreams, what we wanted next, all of it. At that time, I had reconnected with my mentor of 2 years and we talked about my direction and plans. She had spent some time on Vancouver Island in Victoria, B.C. and had told me about her experience there a few years back. She told me she kept thinking of me when it came to that location and asked if I had checked it out, since they speak French in Canada, and the Pacific Northwest is filled with forest, and ocean, and all kinds of outdoor adventure which I loved so much. Ironically, she had NO idea about the friend I had just met who was my only contact in that area. She encouraged me to check out the area and see if it felt like a good fit. I looked more into it and started looking at jobs and opportunities in that area of British Columbia on Vancouver Island. I couldn’t believe it! It seemed perfect. French speaking jobs, outdoor adventure jobs, and so much more! So I applied for several jobs, booked a vision trip for just a few days, and then contacted my friend Andrew in Seattle and he offered to host me for 2 days en route to Canada! I was so grateful and excited about this next step. It felt so right. I booked my flight to Seattle, then a ferry boat to Victoria, B.C. and from there had several stops along the way to follow up on my job applications in person and set up interviews as well. One of the places I planned to look at was Tofino, B.C., where my friend Sander was living on one of the surrounding islands in the inlet there. He and I both shared an adventurous and unique spirit, and I had a feeling that I would see him again, but I had no set plans to see him since he was in the remote wilderness there. I had no idea if he would even be available while I was there, but I had a feeling that our paths might cross again one day, and that our meeting and connection in Iceland happened for a reason! It connected me to this new place that, upon arriving, was evident that it was my next step and home for a season. I can’t even explain to you the connection I felt with this place on the globe. The wilderness, the people, the environment–everything. I decided I would accept the challenge and stay in this place longer than I had anticipated, and accept all that it would have for me and for however long that was supposed to be. So each week after I arrived I was trusting for my next steps to come. I made connections all over the place and was able to meet up with Sander after 2-3 weeks there which was so awesome to reconnect. We spent so much time together — dining, drinking tea, cooking, bike rides to the beach, and chatting about life, the universe, and our paths. I met some wonderful locals, including a beautiful soul named Deanna Lankin who was a local artist. Her artwork was amazing and we got to chatting one day when I went into the shop. We talked about trusting the universe and ourselves and that the next step would come. She painted me a little ceramic piece with the word “trust” in gold, “Because trust is gold,” she said. 🙂 And it was perfect! I held onto that for sure. I found many like-minded people living in this beautiful spot on the globe. People from all walks of life, from all over the world, all there for the same reasons — to live life freely, close to nature, to soak in the raw beauty and power of the environment, and all while in great community. So after 1 month in — I was finally living in a float house on an island close to town. The way that came about was so full of synchronicity too! After weeks of searching for housing, I needed some alone time to think and refuel. So I biked to my favorite beach that day and happened to look over at this island on the way there and I saw several houses. One house particularly caught my eye and I thought to myself, “ok, if I could live there on that island, I totally would!” I didn’t know how people lived out there or how it worked, but I figured I have plenty of outdoor adventure/leadership experience, I could make it work. I’ve been paddling and adventuring in the outdoors for most of my life. But I had no idea if those houses were even available or how to get in touch with anyone living on the island. Two hours later, I’m at my favorite beach, sitting in one of my favorite spots where I go for “me time” and meditate. All of a sudden, out of no where, one of the locals who runs the water taxi, Annie, comes out to greet me with her dogs from the woods behind me! We chatted for a few minutes and she sat down next to me — she asked if I had found a place to stay yet. I told her not yet, that I was still living at the hostel temporarily. She told me that her neighbors were looking to fill their 3-bedroom float home, and if I could find roommates, and kayak and paddle over, that it could possibly work. (I hadn’t yet made the connection to where this float home was located 😉 ) She gave me the owners’ contact info and I reached out to them that evening. The funny thing? It was the exact same house that I had looked at 2 hours earlier while biking to the beach. Yeah, I can’t make this stuff up. So the next few weeks were filled with finding roommates and figuring out a plan, picking up the owners’ kayak they lent me, and going to check out the place in person. It was perfect. It took a while to find roommates who were willing to commit to the lifestyle–paddling to and from home every day, hauling in propane for cooking and hot water, limited showers and water at times, but electricity most of the time. Plus, the weather could get stormy…. and the tidal swell comes in…. and with full moons the tide would be quite strong….and the waves could be high…… For me, it was PERFECT. I live for this stuff! About a month and a half after moving in and living by myself, and cleaning up the place after it had been vacant for almost a year, I finally found 2 roommates to move in around June 1st! The owners offered me a position to be the property manager and tenant of the house — to manage the rental property, create the lease agreements, manage everything and take care of the house and logistics. In exchange, the owners compensated me through my rent each month, so I only had to pay a tiny portion. It was an incredible deal. My rent exchanged in American dollars made it very, very affordable and honestly I couldn’t have asked for a better setup. Especially for living on this amazing tiny house on the sea! I found a rowboat, I used the kayak they provided, and me and my roomies made it work. The Universe truly showed up with more and more opportunities, one by one, as I envisioned what I wanted and needed for my journey. The power of our vision….and thoughts….truly they impact our reality. I had built a great community and found some good friends through one of my favorite spots, the Tofino Botanical Gardens. I knew that I would have to leave at the end of my visa and then come back if the opportunity came about, but I was committed to making this entire season count and be fully present while I was there. Spring and Summer were filled with hikes through the rain forest, climbing mountains, runs on the beach, hikes and trips with friends, enjoying the beach and the waves with these beautiful people, eating amazing food, sunset beach dinners with some of my favorite friends, paddling under full moons and the stars, summer solstice parties, summer storms, and embracing life on the sea. 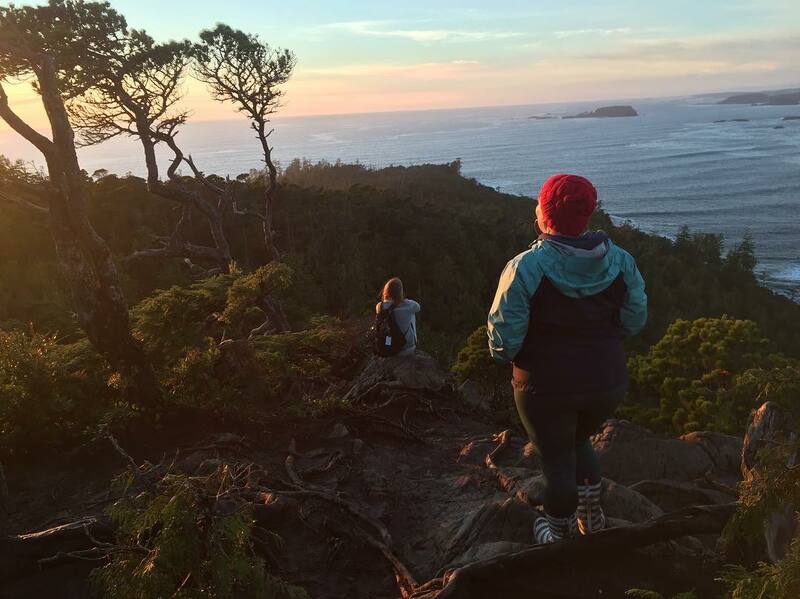 I also experienced wildlife encounters of all kinds…whales, otters, sea lions, harbor seals, harbor porpoises, jellyfish, bioluminesence, sea stars, bald eagles, bears, and even cougars and wolves roamed the area. One of the strangest and most inspiring experiences I had was about 2 to 3 months after I had been in Tofino. Mid-summer 2016. I had already experienced so many synchronicities that summer and many things I had previously envisioned and journaled about a year prior had happened in reality. I couldn’t really believe my eyes because I knew that these wildflowers were not there when I arrived…..so I looked around the beach thinking maybe someone left them there temporarily? But there was no one else around……no one left their personal items there or anything…..it was as if they miraculously appeared out of nowhere. I couldn’t even thank the kind soul who secretly left these for me. But it touched my heart so deeply! I mean, for one, I LOVE wildflowers. I always have since I was a little girl. Hiking in nature from a young age and going on many adventures, you encounter lots of wildflowers on the path. But these wildflowers, couldn’t be found nearby on the beach…..you would have to go into the woods, the forest, and surrounding areas to find these. These were left seemingly with intention. I’ll never forget the experience….the feeling of waking up to these beautiful flowers and just the joy and laughter that overcame me in those moments….. I couldn’t stop smiling. And all I could think about was that dream……from the year before……and I felt so close to the universe in that moment. I felt intuitively that I was EXACTLY where I needed to be in my life and on my journey. It felt like a confirmation that I was moving forward in the right direction and a promise of what was to come. I had my backpack with me that day, so I placed the wildflowers in the side pocket on the exterior of my pack and joyfully walked down the beach with them. I trekked back to my bicycle, and headed to the dock, and paddled home. I proudly put them in a vase and kept them for as long as I could. Upon returning back to the States in October 2016 after my visa ended– it was a season of searching again — getting my bearings for the next direction. In the Fall, I had started envisioning creating a healthy living blog or something in that category as I had been passionate about holistic/natural health and nutrition for going on 10 years. I wanted to share my experience with the world and help others in their health journeys, so I felt like I was going in the right direction for sure. I brainstormed a ton of ideas and names at that point, and the name “wildflower” kept coming into my head. I put all the names and thoughts in my idea box and continued with my current seasonal jobs: coffee shops, freelance, nannying, and pet sitting. I had moved back to Chattanooga for what I thought was my next step and realized 2.5 months later — after discovering maintenance & environmental issues with the house I was renting — that the universe was pointing me back to Franklin. I made a decision the week before I moved back to intentionally figure out my next steps and next direction for my life. It felt like the right time to move forward in a big way again. After all, I wanted to use my skills, passions, and gifts to do work that I really cared about. I wanted to keep using my Bachelor’s degree in Business Management/Health Science & Human Performance, including my passion for the outdoors and a healthy and active lifestyle. In previous years, I had led and managed outdoor recreation programs and advocated for active living and the benefits of getting out in nature. I had worked in event management for several years as well, and I had even started my own event planning business with personal assisting on the side. I’ve always been very entrepreneurial and I wanted to do my own thing in my own style and in my own time, and that’s where I knew I would thrive. I wrote on my vision board for 2016 “The world needs your untamed spirit, your bold ideas.” And I believe that the world really does need our gifts and passions that we can share. We can actually change the world when we show up for ourselves and offer the best and healthiest version of ourselves. So ultimately, I wanted to create the life and work that I really envisioned. And that meant I had to do something that was my style and build something I was passionate about where I could use my creativity. Gandhi said, “Be the change you want to see in the world.” And I wanted to change the way the world does health. So that led me to April 2017, and my mother had now fully recovered from lung cancer after having a critical surgery in October 2016, so by the time Spring rolled around, she was feeling much better and doing very well. She occasionally felt off, so I gave her some natural solutions and lifestyle changes she could use, and she felt much better within the next week. So I thought, “hmm, interesting. I’ve always been passionate about natural / holistic health, what if I could help others too?” I’ve always been very health conscious, had transformed my weight in high school and college, and ultimately wanted to make good health decisions consistently in my life. Friends and coworkers had often asked me what products I use and about supplements and natural foods, overhauling their pantries with the right foods and healthier alternatives. I had spoken with my mentor the week I moved back to Franklin in April 2017 and brainstormed ideas. She asked me what makes me come alive, what do I already do that I’m passionate about regardless of money, and what feeds the fire of my soul. So I began looking more into it. I realized that week that I had already been on this journey for a long time….for 10 years! The journey of Holistic Health & Natural Living. So I found a school program to support this decision, an accredited, reputable 6 month program to become a Certified Health Coach. It all made so much sense! I am pursuing the life coaching certification as well because it’s something I am also passionate about. My personal goal is to help people follow their bliss, master their mindset, experience habit change and ultimately transformation. So all of this tied together so well and I knew it was for me! It unfolded seamlessly, and now I’m 3 months into the program, starting to work with both practice and paid clients. Through holistic health & wellness wisdom, I’m on a mission to empower people to take back their health and transform their lives so they can flourish and follow their bliss! What I love about the name wildflower is all that it represents for my path — the sign that it has been for me from my dream to reality. All the synchronicities, the symbolism, the encouragement and nod from the universe. For me, it truly represents new beginnings. Wildflowers represent so many things. Wild…..undomesticated by society, untamed, free, wild, natural. Flower….the verb meaning to bloom; to be in or reach an optimum stage of development; develop fully and richly. And that’s exactly what I want my clients to feel when they work with me — free to reach their goals and be the healthiest, happiest, and best version of themselves. I move to California within the next week…..to start a new chapter and to move forward there. I’m trusting where this step is leading me and enjoying the adventure of it all. And in more ways than one, it really is a new beginning.